It may come as a bit of a surprise to many that although Celtic coins have not (yet) been discovered in Ireland, there have been a lot of Roman and Anglo-Saxon coins found – especially the latter. Conservative Irish historians have always said the Romans never got here but they rarely even mention the Anglo-Saxons in the Early Medieval context. We also see modern cartoons and paintings of Vikings with ‘horned helmets’ but, although the Vikings never wore them, the Anglo-Saxons certainly did. Has this fact been distorted over a long period of time and remains with us via a sub-conscious memory manifesting itself in our rich oral tradition of story-telling ? the ‘gold’ phase of currency, which began with an increase in the rate of importation of continental gold, principally in the form of tremisses. From around 620 AD, English gold coins of similar format were produced, often known to numismatists as thrymsas. By the middle of the 7th century the quantity of gold in these coins was falling quickly, such that by the 670s they were more or less completely silver. The age of the sceattas – small, thick silver coins which evolved out of the latest, debased gold coins. These should more correctly be referred to as pennies or denarii as in weight and fineness they approximated the form the English penny was to retain for centuries, and contemporary references suggest this is how they were known. Most sceattas do not bear an inscription and are thus difficult to attribute. The moneyer’s name remains because it was a personal guarantee of quality and value. There is evidence that moneyers worked for several monarchs – even in the event of a hostile takeover or over a period of bitter feuding. The moneyer, it seems, was a valuable asset to a medieval ruler. At Christmas 1124 all of the English moneyers were summoned to Winchester, where most of them were castrated and had their right hand amputated, on the orders of Henry I. The king seems to have suspected the moneyers of malpractice, and he acted with typical ruthlessness. From the 9th century, monarchs and their governments gained greater power over the control of coin production, and the designs used by different moneyers became standardised. Silver pennies of similar design remained the basis for the English currency and subsequent Hiberno-Norse currencies until the 14th century. Pennies of this form were made by English kings from Offa onwards, and also by Viking rulers of Dublin from the later 9th century. In the 860’s, the Anglo-Saxon kingdoms of Mercia and Wessex formed a monetary alliance by which coinage of a common design could circulate through both of their lands. This was an important step in the introduction of a ‘common currency’ across two separate political entities. The ubiquitous silver penny had arrived ! Towards the end of the reign of King Edgar, there was an important ‘reform’ of the Anglo-Saxon series and it inflluenced the design and production of English coins until the reign of Henry II – the Norman king that oversaw the invasion of Ireland in 1169. Previously, the same type was used throughout the country but die production devolved to a number of regional die-cutting centres which distributed dies to nearby, smaller mints. 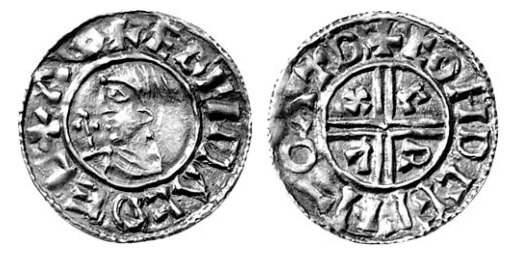 Even within the nine-month reign of Harold II in 1066 coins were struck with a new design in his name at forty-eight mints. Now, just one mint, controlled all of the others. Around seventy places in England (and in Wales under the Normans) were active as mints during this period, ranging hugely in size and productivity: the largest was London, though York and Lincoln remained important throughout the period, and other major mints included Winchester, Norwich and Stamford. At the other end of the scale are places that were never important mints in the Anglo-Saxon period and are little more than villages, hillforts and market towns today, including Melton Mowbray, Milborne Port, Castle Gotha, Cadbury Castle and Dunwich. Mints of this kind were often only active during short periods, such as a number of ’emergency’ mints set up during the reign of Æthelred II because of Viking depredations. This first type, usually known as the First small cross or Reform type, remained in currency for Edgar’s last years, the whole of Edward the Martyr’s short reign and even into the first years of Æthelred II, who came to the throne in 978/9 AD. Within the reign of Æthelred, for instance, seven different design types can be seen in the progression of the following consecutive issues: First Small cross; First hand; Second hand; Crux; Long Cross; Helmet; and Last Small cross. because the Dublin Vikings copied Æthelred’s coinage from about 996 AD onwards. Aethelred II, Type 4 penny – Crux penny, Moneyer, Beohrtsige of Winchester. These are the equivalent to Hiberno-Norse, Phase I (Class A) that Sihtric ‘imitated’ between 996-1001 in Dublin. Aethelred II, Type 5 penny – Long Cross penny, Moneyer, Eadmund of London. These are the equivalent to Hiberno-Norse, Phase I (Class B) that Sihtric ‘imitated’ between 1002-1008 in Dublin. Aethelred II, Type 6 penny – Helmet type penny, Moneyer, Manna of Thetford. These are the equivalent to Hiberno-Norse, Phase I (Class C) that Sihtric ‘imitated’ between 1009-1011 in Dublin. Aethelred II, Type 7 penny – Last small cross penny, Moneyer, Fastulf of Thetford. These are the equivalent to Hiberno-Norse, Phase I (Class D) that Sihtric ‘imitated’ between 1011-1016 in Dublin. Cnut (1016-1035) Type 1 penny, quatrefoil type, Norwich, Edmund. These are the equivalent to Hiberno-Norse, Phase I (Class E) that Sihtric ‘imitated’ between 1016-1018 in Dublin. 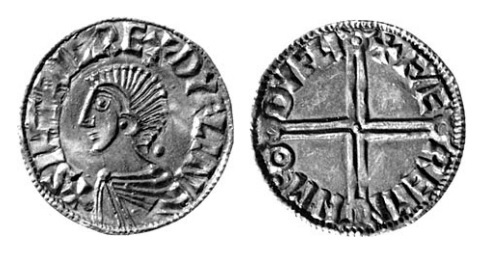 Numismatists have sometimes tried to discern a very rigid system of organisation in the late Anglo-Saxon coinage: one, Michael Dolley, believed that until the death of Cnut in 1035, each type lasted six years, with a few exceptions – such as the Last Small Cross type at the end of Æthelred’s reign – lasting longer under very unusual conditions. Recently, numismatists have begun to question the validity of this strictly ‘sexennial’ issue theory. These coin (Anglo-Saxon, Phase 4) types are commonly found in Ireland, although the reason for them being there is hotly debated. The prevailing view is that the Vikings brought them to/from Ireland to facilitate trade, although a lot of them seem to have been found in native Irish held lands. The first Irish coins were the Hiberno-Norse, Phase I coins produced by the Dublin Vikings under Sihtric. For almost a hundred years prior to this, the Dublin Vikings and others in Ireland used Anglo-Saxon coins for trade purposes. 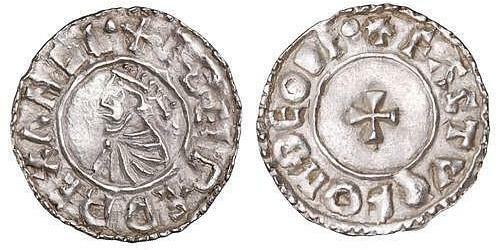 Just like coins ‘imported’ from Gaul were the precursors to Celtic coinage in Britain, ‘imported’ Anglo-Saxon coins were the precursors to the Hiberno-Norse coinages of Ireland. 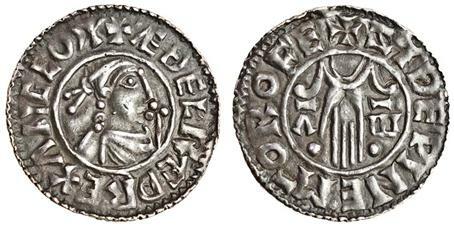 Vikings in other places had been copying / imitating the silver pennies of Aethelred, including those at York and the first native-produced coins of Denmark and Sweden were also Anglo-Saxon imitations. The Hiberno-Norse coins are imitations of Aethelred II’s coins, therefore these Irish moneyers were practising their craft some time after the first Hiberno-Norse coinages. ← What is Celtic Ring Money ?